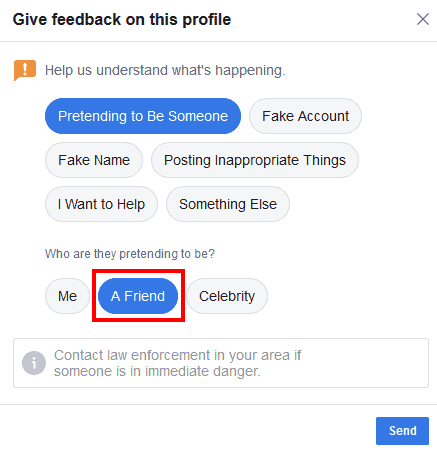 Home Featured [ANSWERED] How Do I Spot And Report A Fake Facebook Friend Request? A great question that arose recently when a good friend sent me a Facebook request. While I would love to be their friend on Facebook, the problem was that I was already friends with them on Facebook. In fact, the day before I received the “request” we had lunch together and had discussed some of the photos of his recent vacation that he had posted on Facebook. Since I was already Facebook friends with him, I knew it was a fake Facebook request. How do I report and block a scammer who has sent me a fake Facebook request from a friend who I am already friends with? It’s a fairly straight-forward process, so I’ll walk you through the process. Should I Even Care If A Scammer Sends Me A Fake Facebook Request? You absolutely should care, but only if you like your privacy and security of your personal information! Why should you care about these types of fake Facebook profiles? Because they could be used to harvest personal data from your friends or family members…and eventually you. Joe Scammer creates a Facebook account with data harvested from your sister’s Facebook profile. Next, Joe Scammer sends friend requests to your brother, who is confused…but accepts the friend request anyway. Now, Joe Scammer can see all of your brother’s private information that was previously only accessible to his friends, because of his Facebook settings. Being the nefarious cur that he is, Joe Scammer can use that information to attempt to hack your brother’s personal data. Anyone who is friends with your brother, who also has their privacy settings set to show data to “friends of friends” is now open to the scammer to start data harvesting. As you can see, every person that accepted Joe Scammers Facebook friend request not only exposed their personal data to a scammer, they potentially exposed their friends to future scams, as well. OK…So If I Want To Report A Fake Facebook Friend Request, How Do I Do It? Naturally, I didn’t want this scammer using the fake Facebook profile to scam others into friending it and then harvesting their private user data, so I went on the warpath to get this fake profile removed. I figured documenting the steps would help others that run into this situation in the future. The first step is to double-check to see if you are already friends with them or still friends with them. Things happen, they might have accidentally unfriended you, but now they have decided that they want to be friends again. Or maybe they unfriended you over a heated political discussion (we all know it happens) but now want to smooth things over. Either way, the first step is to confirm that you are actually already friends. If you see them in your friends list, then you know you are already friends and the new request is fake. Fake Facebook Requests Are Your Enemy! 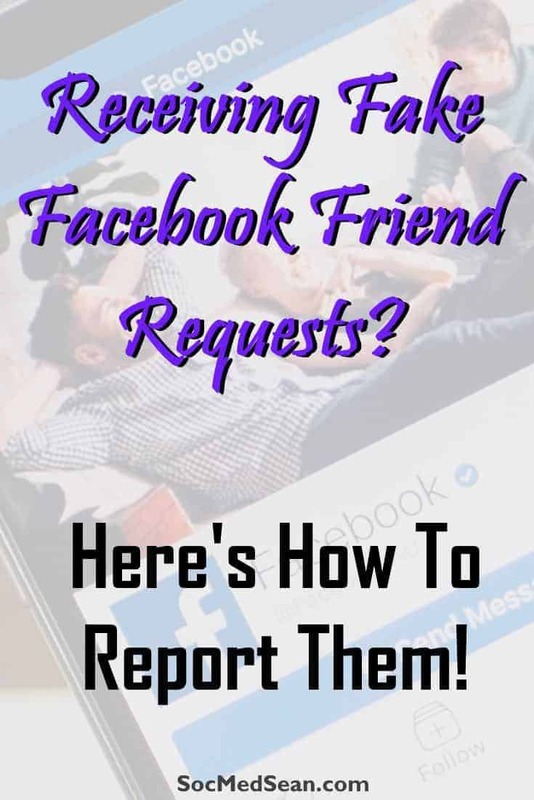 If someone can get you to accept the friend request, then they can see all your contact information (including your phone number if you make it available to your friends). They can then monitor your posts for information about your kids, your location, etc…Then, they can try to set you up for a scam because they know a lot about you. But all the more reason to report the fake account. 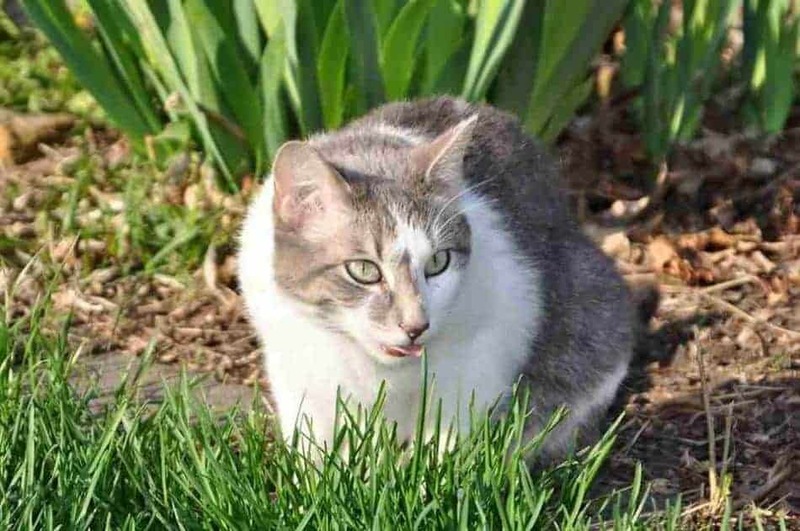 2) Click your profile photo in the upper-left corner. 4) In the Search box, type your friends’ name. Be sure that you spell it correctly. If you see your friend in the list of people that you are friends with, then it’s likely that the “friend request” or “Messenger request” is a fake profile. Note: Be sure that you are checking the possible derivatives of their name. If their name is Becky, be sure to check to see if they use Rebecca as their Facebook name. It’s possible that your friend can’t get into their old Facebook account and can’t reset the password, so they are just creating a new account. 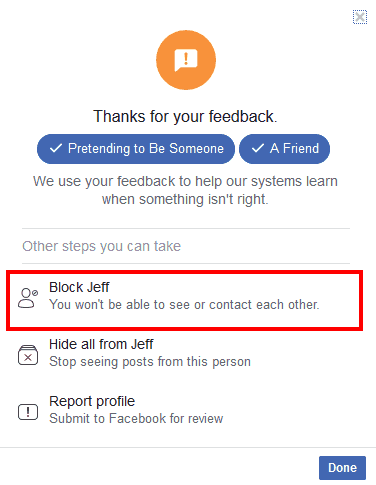 If that’s the case, and they confirm that they sent you a friend request then it’s okay to accept their request and add them as a new friend. Just be aware that you will have two entries in your friends list with the same name, so when you tag them or message them, be sure you’re using the correct account. So, What Do I Do With This Fake Friend Request? The first thing you do is DO NOT ACCEPT IT!!! 1) Click on the name or profile photo of the fake account. It won’t hurt anything if you are just viewing their profile. 2) Copy the link to the fake profile. At this point, it’s a good idea to send a message to your real friend via email or Facebook Messenger to let them know that someone is impersonating them. Let them know that they can report the person and have Facebook review the account. You can even send them a link to this article to let them know how to report the scammer. 3) The next step is to report the fake profile to Facebook. The more people that report it, the more serious Facebook will take the incident. Since you are already on the scammer’s fake profile, click the three dots next to the “Message” button and from the menu, choose “Give feedback or report this profile”. 3) After clicking that link, you will be asked to indicate why you are reporting the profile. Click “Pretending To Be Someone” since this scammer is impersonating your friend. 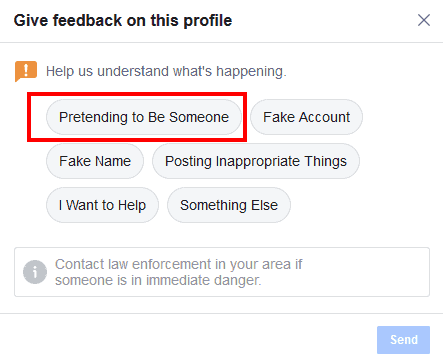 Select the option that the account is pretending to be someone to report the fake Facebook profile. NOTE: You can use this exact same form for a variety of different purposes. If an account is completely made up, is posting things that are inappropriate, or harassing you this form is how you would report it. If, though, you feel that the person is putting you in immediate danger you should call the police, don’t wait for Facebook to help. 4) Once you click that, it will ask who the scammer is pretending to me. Click “A Friend”. Indicate that the fake account is pretending to be your friend. 5) Click “Send” in the lower-right corner. 6) Finally, the message box will have you search for the friend who the scammer is trying to impersonate. Search for your friend and then click the radio button to the right of their name. 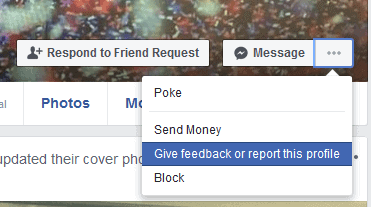 Click Next and Facebook will confirm the receipt of your fraud request. 7) The last step is to block the scammer. Click the link to “Block ______”, where _____ is the friend’s name. You are not blocking your real Facebook friend. You are only blocking the scammer who is using their name. The last step is to block the fake Facebook profile. 8) The message box will ask you to confirm that you want to block the person. Click “Ok”. 9) Once you have blocked the fake account, you will see the message box change to show that the account is blocked. 10) Click “Done” and the dialog box will close. Whether you know it or not, you have a Support Inbox with Facebook. Everyone has one, but most people don’t know it exists. Whenever you open a support ticket with Facebook, they generate a ticket and you can monitor any updates to that ticket in your support inbox. 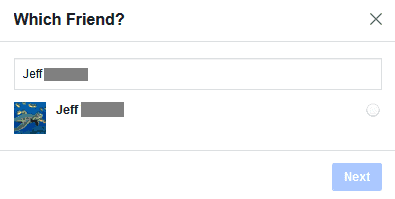 To view your inbox, just go to https://www.facebook.com/support or click the question mark icon in the upper-right corner and choose “Support Inbox from the dropdown menu. You should see a ticket regarding your report of the fake Facebook profile. As you can see, Facebook basically acknowledges my ticket and let’s me know if there are any questions or next steps. Believe it or not, with all Facebook’s fancy algorithms and privacy/security settings, the best defense against spammers is actual the user community. That’s you and me. That means when we see scammers, we need to do more than just ignore them, but to take proactive steps to report them and get them booted off the network. The more we report, the faster Facebook can give them the boot and the safer Facebook will be. How Big Is The Problem Of Fake Facebook Accounts? In fact, the fine folks at Social Catfish pulled together an amazing infographic that helps demonstrate where fake social media accounts come from, how to spot them, the numbers around their growth, and a little bit of data regarding what the big networks are doing to crack down on them. In reality, though, it’s up to us as users to report these scammy accounts when we see them. 1) Change your passwords – Update those passwords for your Gmail, Facebook, Twitter, and other big social networks. Be sure you are using strong passwords. 2) Check your Facebook privacy settings and think about where you are accessing Facebook. 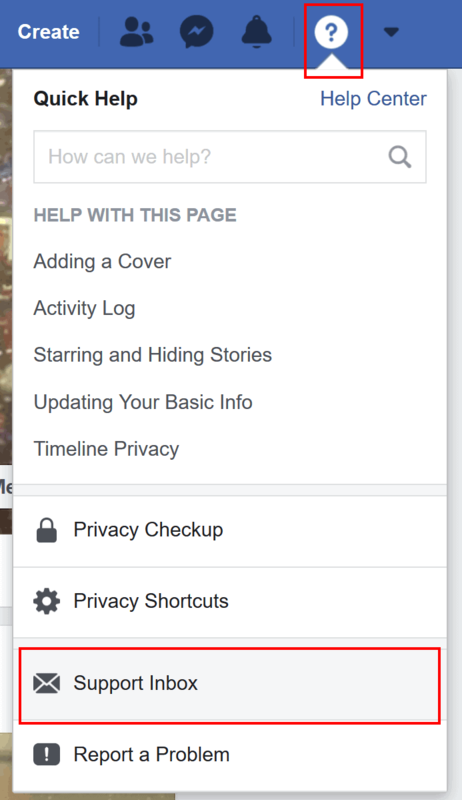 Run a privacy check to make sure your Facebook content is protected. Additionally, think twice about using public WiFi if you aren’t using a VPN. 3) Review your Facebook friends list – Do you really want to be friends with all those folks? Maybe this is a good time to pare down that list fo friends. By doing so, you could reduce the potential number of security breaches that could happen, exposing your personal data. I hope that helps! Anything we can do to help keep Facebook free from fake profiles is a step in the right direction. If you have another way to battle or report these fake Facebook profiles, please let me know in a comment. I’d love to hear how others are handling them.